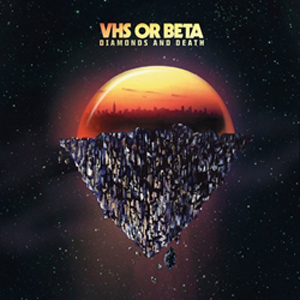 The latest from VHS or Beta, upon repeat listens Diamonds & Death gets better. Subtle interplay between snyth, guitars, and effects peek through familiar fields of electronic beats and repetitious keys. On new listens, initial similarities to gay disco house start to fade, as small moments emerge. But really, is this seriously the best compliment I can come up with for an album I’ve been waiting four years to hear? On “Alive” the band brazenly wore their Cure badge on their sleeves, or Daft Punk iron-on patch playing “Forever”. In brief moments here, like on “All Summer in A Day” or “Diamonds and Death“ I question if they are sportin’ a Cher pin too. Okay, they never crank the vocoder up to Cher levels, but please believe that much of this album wouldn’t be out of place throbbing in a club with go-go boys gyrating in briefs ‘n boots. Then again, this is territory Daft Punk often bounce to as well. The album is less renewed-wave guitar pop and more smooth hazy house. A soft glitter binds these songs into a more cohesive whole than previous albums. There might not be standout driving or anthemic singles propelling you to the dance-floor, but a few moments eventually pull you into their dreamy bliss. The intriguing twists and pulsating rhythms of “Jellybean” encapsulate where they have gone and make you wonder where they might go next.